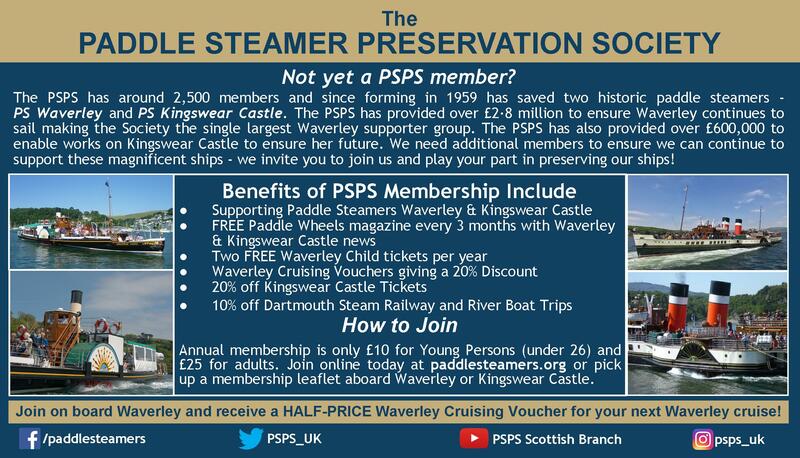 On 25th June 2009 Waverley was chartered to Clydebank High School for a reunion of former staff and pupils. The following pictures were taken by Mr Tom MacDonald Tom's pictures were taken from the site of the former Beardmore's Dalmuir Naval Construction Works. When Tom started his working life the Dalmuir site was partly operated by Renfrew-based Babcock & Wilcox Ltd (making power station machinery) and partly by the shipbreaking firm of Arnott, Young & Co. The first picture (above) shows Waverley passing the former John Brown shipyard site, originally developed in the 1870s when the firm of J & G Thomson & Co moved downstream from their Clyde Villa Shipyard, a site now occupied by the Glasgow Science Centre and Waverley's current home berth. The second picture shows Waverley rounding the Dalmuir bend, where the great Clydebank-built liner Queen Mary grounded temporarily on her first (and only) traverse of the Clyde on 24th March 1936. 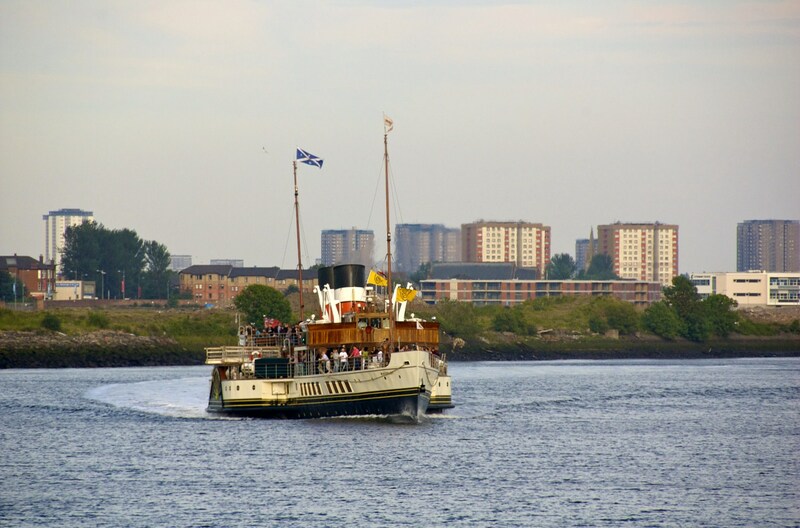 The two prominent yellow flags on the paddler carry the CHS logo of Clydebank High School. The only remaining structure of the former Brown's shipyard site is the giant cantilever crane now known as the Clydebank Titan (below, behind the paddler). Only about 60 giant cantilever cranes were ever built (globally) and, between 1906 and 1971, six of the total were on Clydeside. The first one was built almost on the site where Tom was standing to take this picture - the west wall of the then new Beardmore's Dalmuir shipyard fitting out basin. It was designed by the German-based Benrather engineering company and fabricated in the east end of Glasgow by the Parkhead Electric Hoist & Crane Company. The Clydebank Titan was built one year later by the most prolific builder of giant cantilever cranes, the famous structural engineering company of Sir William Arrol & Co, which was also based in the east end of Glasgow, at the Dalmarnock Iron Works in Dunn Street. Arrol was also noted for other famous structures such as the Forth Bridge and the steel structure of London's Tower Bridge. By 1910 Arrol had taken over its rival's Glasgow works and the firm went on to buid another 3 of the Clyde's 6 giant cranes (at Fairfield's Govan shipyard, the North British Engine Works in Whiteinch, Glasgow and Greenock's James Watt Dock). The Benrather crane at Dalmuir was demolished in the early 1970s and the Fairfield Crane (in BVT's Govan shipyard) was demolished in 2007. 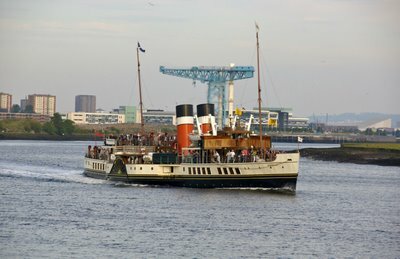 The list of world renowned ships built by Thomson's and Brown's is far too big to reproduce here but it includes such famous names as the Inman liners City of Paris and City of New York, the legendary Clyde paddle steamer Columba, the Cunard liners Lusitania, Aquitania, Queen Mary, Queen Elizabeth, Caronia, Queen Elizabeth 2, the warships HMS Hood, HMS Vanguard (Britain's last battleship) and HMS Intrepid (currently being demolished on the Mersey). Sadly, with the recent withdrawal of RMS Queen Elizabeth 2, active Clydebank-built ships are almost non existant, one of the last being the beautiful Kungsholm, originally built in 1966 for the Swedish America Line of Goteborg. 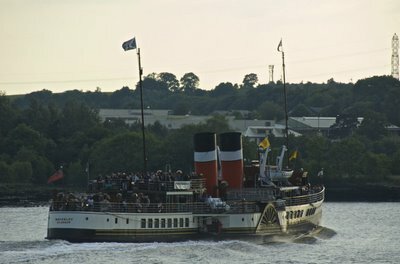 Final view of Waverkey heading down river on the Clydebank High School charter - thanks to Tom MacDonald for these pictures.